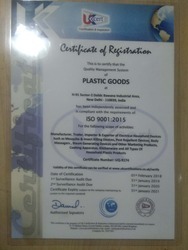 Established in the year 2005, we "Plastic Goods" are the leading manufacturer, importer and trader of a wide range of Electric Insect Killer, Pest Repeller, Body Massager, Acupressure Sole, etc. Located at New Delhi (Delhi, India), we have developed an ultra-modern infrastructure unit. Under the stern supervision of our mentor Mr. Mahender Saini, we are successfully increasing our business in this competitive market. Our in-depth market knowledge and immense experience enable us to offer a quality approved range of products to the customers. We have constructed a state-of-the-art and highly advanced infrastructural facility that disperses over an extensive area of land. In order to carry out well-defined business process, we have properly integrated this facility into diverse sections. In order to accomplish excellent productivity, our hardworking and dexterous team of professionals uses sophisticated machines and technologies.